Today’s guest is COL Jean Barido, the Commander of the US Army Public Health Command – Central. The Command provides public health leadership and evidence-based preventive medicine programs and veterinary services to optimize the health of military units, installation personnel, and animals within 20 states, the Caribbean, and Central America. 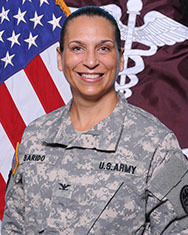 In this podcast we talk about COL Barido’s career as an Army Nurse Corps officer, starting in the reserves and then transitioning to active duty. We discuss her many roles in the military including deployments to Kosovo and Afghanistan, and then discuss her role as the Commander of a dispersed unit with many diverse missions. We conclude with a discussion of leadership. 1:04:36 careers: why public health? Why nursing?